12,226. Thats the number of youth-led projects that were supported in the first year and a half of the Youth Opportunity Fund and Youth Capital Fund. And the decisions on how to spend the Â£115m that made those projects happen were almost universally led by panels of young people. I was recently involved in the national Actions Speak Louder Awards (lots of photos on flickr here), supporting a judging panel of young people to select 15 of the best examples of youth-led projects funded through the Youth Opportunity Fund from across the UK. The group (the Youth Empowerment Panel) were deciding on how to spend over Â£500,000 in extra grants to the best projects. For me the experience demonstrated that when you give young people responsibility, they rise to the challenge and take it on with maturity and great attention to fairness, quality and detail. Far too often we hear it said that young people are not responsible enough to handle serious decisions. But the evidence doesn't bear that out. More often than not, we're keeping serious decisions from young people, not offering them to chance to start exploring and develop the skills they need to demonstrate responsibility. Giving young people control of cash, in structures where they are accountable to their peers, gives young people real power, and gives them the opportunities to excercise it responsibly. The 10 Year Youth Strategy also called for up to steps to be made towards putting 25% of local youth activity budgets directly in young peoples hands by 2018 – so we're going to be seeing a lot more youth led control of budgets and funding in the future. Youth Opportunity Funds on DirectGov. One of the strengths of the Youth Opportunity Fund is that local areas have been able to choose how to brand and promote it locally. 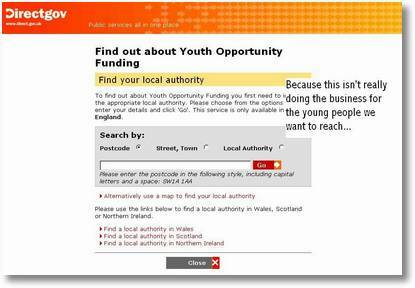 However, that does mean if you're a young person in England trying to find your local Youth Opportunity Fund panel you may find that it's called something different (e.g. The Big Stash, Cash for Action, YouthBank etc.). To find your local fund, you can either use the search feature on DirectGov, or you can contact your local council or youth workers who should be able to tell you who to get in touch with. 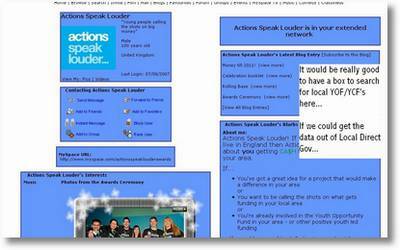 Young people from Headliners recently created this video to help promote the Youth Capital using case studies from Actions Speak Louder. If you would like a copy on DVD to help you promote the Youth Opportunity Fund to a group you work with, drop me a line and I'll see what I can arrange. There is also this celebratory booklet showcasing all 15 award winning Actions Speak Louder projects. I'd be really interested in working with one or more local Youth Opportunity Funds to explore how social media can help in promoting the funds to hard-to-reach groups. If you're involved in a YOF/YCF and would like to chat about that more… do drop me a line.